If you are looking for an easy to learn therapy and gain a good grounding knowledge of energy therapies then Usui Reiki is a great starting point. Angelic Reiki is an energy therapy that calls on the Angelic Realms to connect with Angelic energy to help with healing. During this 2 day course you will learn how to connect with the Archangels, and Ascended Masters plus much more. 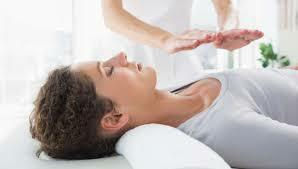 Reiki I covers all the basic aspects of Reiki, including history, self-healing and healing others. Reiki II is Practitioner level and once completed enables the student to practice on the public, once appropriate insurance has been obtained. “I did my Reiki I, II and Master/Teacher levels with Anne. Finishing all 3, I am so pleased that Anne was my teacher. She was so thorough and made the learning experience a pleasure. Anne was always on hand if we needed further help or advice. She is kind and thoughtful and always has time for you. The lessons were interesting and creative. Anne took the time to make sure we all understood each level of Reiki and also made the lessons fun. I cannot stress enough what an excellent teacher she is! If you are thinking of learning Reiki or have a Reiki treatment then Anne is the best person to see.